The Volkswagen Golf is in its third generation. It's grown bigger over time and looks like them modern hatchbacks do - European and chic. While many may think the bread and butter model of Volkswagen will be the up! or the Polo, it's the Golf which brings in those sales numbers. In fact, every third car them Germans buy is a Golf. Hey, wait a minute. I am not ranting here. I have just gotten off the driver's seat of the Volkswagen Golf and while it wasn't the GT TDI or the GT, it was an electrifying experience nonetheless (pun intended). It was the e-Golf. And there are thousands of them in Wolfsburg where I got to drive the Volkswagen e-Golf. Wolfsburg also happens to be the hometown of Volkswagen and hosts it's biggest facility in the world too. The Volkswagen e-Golf as discussed before looks modern. It has that typical understated looks that we have seen on many other cars that wear the VW badging or even roll out from sister concern companies. Those arresting LED DRLs complement the blue-outlined full LED headlight set-up perfectly. You would also not miss the e-Golf badging on the grille. The alloy wheels look as if they are from a much more expensive vehicle. 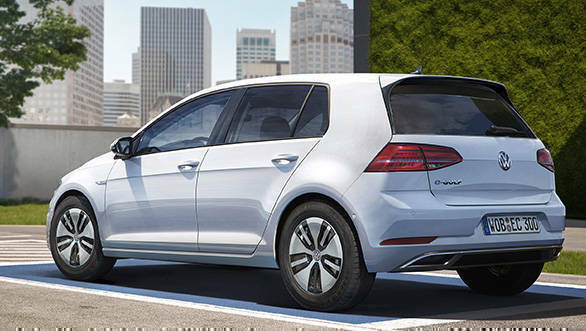 The rear too has sharp lines and bode well with the overall stance of the e-Golf. I liked the e-Golf's cabin with its minimal buttons and all. It is spacious too, both at the front and rear. MQB platform cars are usually known to be spacious and the Volkswagen e-Golf is no different. The flat-bottom steering wheel has been borrowed from the regular car but the blue-backlit meters here are different and feature a power meter as well as the speedo. Speaking of blue, it seems to be the theme for the car with it being used for the badging, headlights, steering wheel stitching as well as the upholstery. The 8-inch touchscreen system gets Android Auto as well as Apple CarPlay and is crisp to use. Similar to what I have experienced in the Octavia RS' music system, this icons zoom in once it detects the approaching finger tip. The boot space too is 341 litres, 40 down from the standard Golf's. VW has bolted the battery pack to the chassis of the car and this ensures that the boot space isn't compromised by much. The 2017 Volkswagen e-Golf, as the name suggests, is a pure electric car. It uses a 38.5kWh battery pack that translates to 136PS of power and 290Nm of torque from zero rpm. The battery pack is made of a battery junction box, cell controller and management system. About 24 individual cells weighing 12kg each make up for the battery pack. As is usually the case with electric motors, its very hard to tell if the car is on or not. 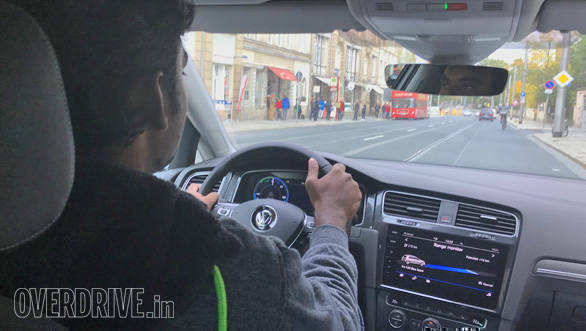 In case you're worried that pedestrians will not notice you creeping up on them, Volkswagen has got you covered with a switch in the cabin that mimics the sound of a naturally aspirated engine but in a slightly faint manner. A slight touch on the accelerator and the e-Golf moves ahead smartly. In fact, this is one part that I like about the e-Golf as an electric car. I have driven a few India-made electric cars and while the overall effort was noteworthy, the performance of the vehicle leaves a lot to be desired. Not with the e-Golf. Volkswagen has ensured that you don't miss out on any fun associated with the regular Golf. This means a sub-10s 0-100kmph time and a top speed of 158kmph. An ex-colleague who was driving the car on the autobahn managed to max out the e-Golf at 158kmph. In fact, it was commendable the way the car could keep up with other small conventional powered hatchbacks. However, in doing this, we nearly lost 30km range as indicated on the meter. 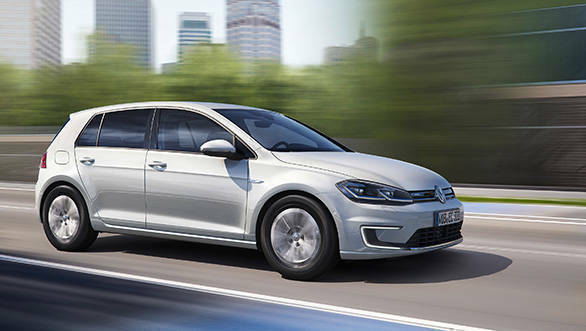 Volkswagen claims a driving range of 300km with the e-Golf, 240km being easily doable in everyday driving conditions. There is also regenerative braking and the fun fact is that it increases the initial driving range if one is careful enough. For example, we started off with a range of 273km and after a 15km jaunt, the figure went up to 286km. Volkswagen also offers a B-mode along with the regular drive modes - Normal, Eco and Eco+. The throttle of course is the most relaxed in the Eco+ mode in the interest of increasing the range. The projected kilometres change each time you change the modes. The B-mode in fact brings in the most regenerative braking and is good for those autobahn cruises. 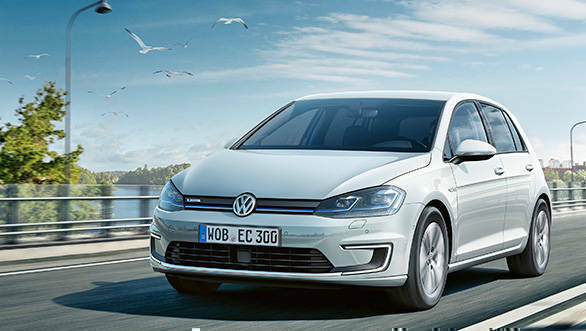 Just like your mobile phone, the Volkswagen e-Golf too has to be charged so that it can function properly. A regular charge will take anywhere between 6-8 hours whereas the optional fast charger will give 80 per cent charge in less than half an hour. In Germany, many conventional petrol pumps have been converted into electric charging stations. Majority of the office buildings too have chargers installed in their parking lot. An eight year warranty on the drivetrain ensures that all your battery worries are taken care off. 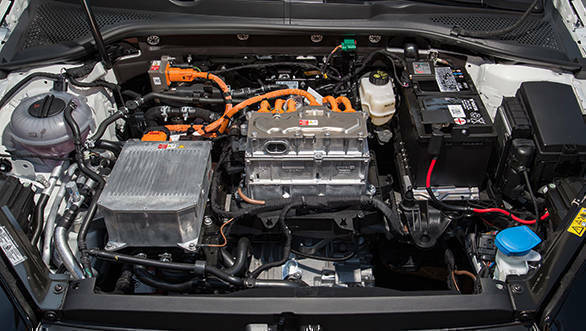 The Volkswagen e-Golf is one feature-packed electric car. Not to the tune of a Tesla but still quite high given that it's only a hatchback. India unfortunately may not get this version of the e-Golf purely because electric cars haven't done well in the country so far and the infrastructure still isn't up to the mark yet. However, there is a new MEB platform coming up for Volkswagen electric vehicles in 2019. 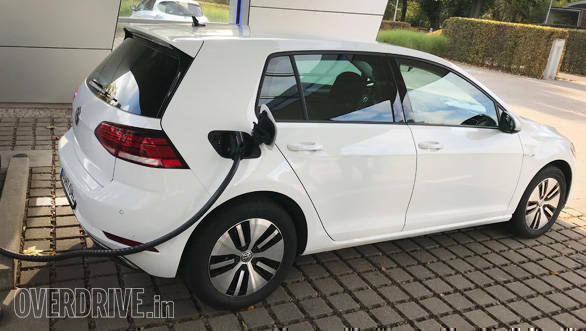 With the Indian government's focus on electrification of vehicles by 2030, it is but natural that Volkswagen might look at bringing the e-Golf as a halo product. It is spacious, looks the part and is also practical. There is adaptive cruise control, lane assist, emergency braking and six airbags in case you were wondering about safety. Affordable motoring and driving pleasure without the guilt of depleting natural resources? You get them all in the Volkswagen e-Golf.